Training takes place at dojos and firing ranges around the country. 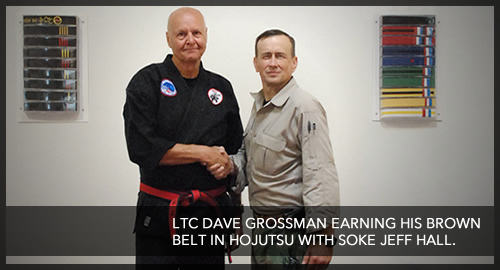 There are currently dojos in Alaska, Washington, Idaho, Colorado, Nevada, Texas, California, Georgia, and Italy; contact Soke Hall for information. Students are taught the Modern Technique of shooting as developed by Col. Jeff Cooper. Students are also taught kata, weapon retention, empty hand techniques and reigi (protocol) inside the dojo setting. Firearms training has been divided into ten "kyu", or levels, taking the student from novice to black belt ranks. Students with no firearms training may consider attending one of the major schools in the country that teach the Modern Technique (emphasize that you wish to train in the Weaver Stance). These schools include American Small Arms Academy, Gunsite, Front Sight, and Thunder Ranch. Local dojos may arrange for soke or a senior black belt to travel to your area for a seminar.